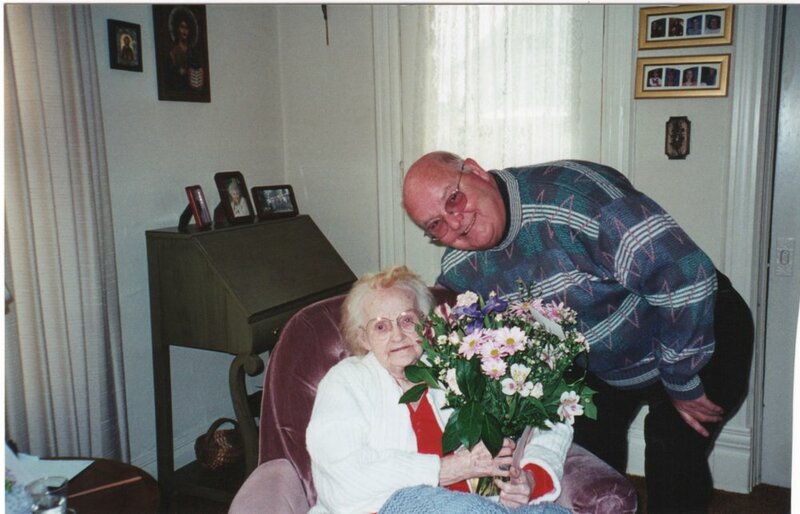 What better way of commemorating the 100th straight Pic of the Week at The Psychogenealogist than featuring Ida Rhoads Sears (1900-2002), my great grandmother who, in 2000, celebrated 100 years of life well lived! If born just a few weeks earlier than her February 17, 1900 birthday, Ida would have achieved the rare distinction of having lived in three different centuries! Here she is around 1969, staring at the camera with arm outstretched. 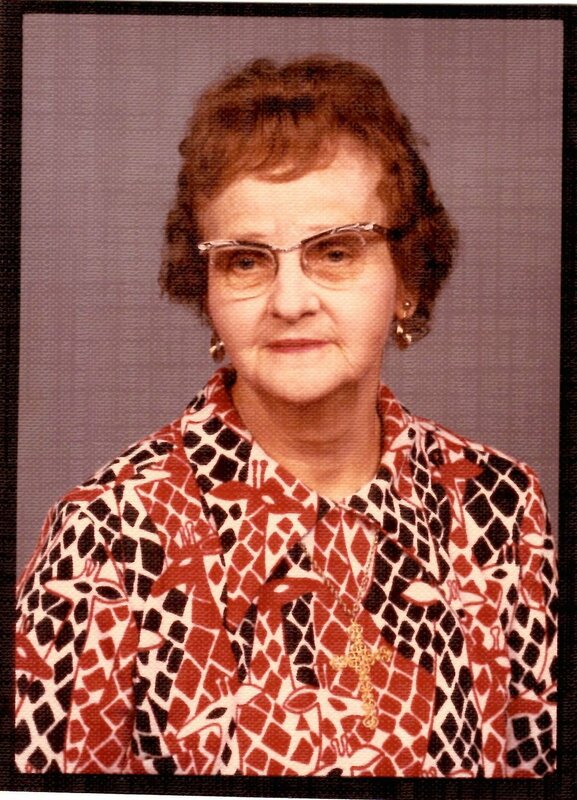 Though before I was born, this is exactly how I remember Ida: smiling, festive, and ready to party! To her right are Ida’s two daughters, my great aunt Mary Margaret “Peggy” Sears Smith (1928-2008), and my grandmother, Betty Grace Sears Hanley (1924-1981). On her left is Ida’s granddaughter in law. Here is Ida looking a little more serious, in an remarkable black, white, and red giraffe print dress. Ida lived well into my young adulthood and I have fond memories of her. I regret not asking her more questions when I had the chance. Ida was the youngest of 15 children. Here she is as a young girl in Dunlo, Pennsylvania (Cambria County) surrounded by her parents and older siblings. 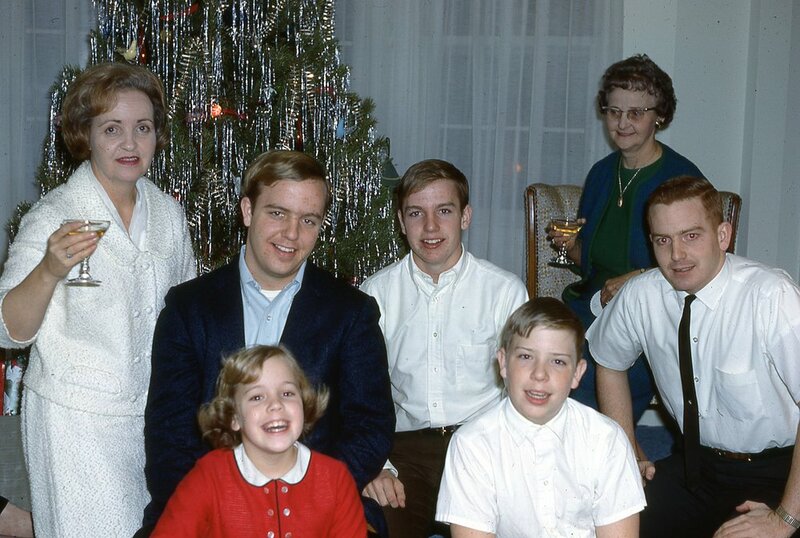 And here she is, some 60 years later, celebrating Christmas with her children and grandchildren. I love the way she exuberantly tears into this gift of two bottles of champagne and what appears to be a mink stole. There are probably at least a thousand other photos of Ida I could have included in this post. Here are just a few more. But most of all, I always got the sense that she was very proud of her family. Ida lived independently, in her own home, well into her 90s. It was only in the last few years of her life that she moved into a nursing home. She lived two days past her 102nd birthday. Here she is with her only son and Catholic priest, and my great uncle, Monsignor Eugene Sears. To this day he is affectionately and respectfully referred to as, “Uncle Father”. Ida was faithful, kind, and charitable. She lived a remarkable life. It was a life that I learn a little more about every time I work on my family tree. Her story — none of our stories, really — are ever fully written or told. But, there are great joys, and sometimes important sorrows, to be experienced as we learn and share these stories of our ancestors with others. Older PostThe Psychogenealogist Pic of the Week (#99) - Is This the Family of Moses Devore (1844-1917)?